The Alberta Innovates Bio Solutions (AI Bio) team brings a wide range of experiences and depth of knowledge about the forest industry’s needs to its role of helping industry take advantage of new opportunities, particularly as it relates to the unfolding bio-economy. Dr. Stan Blade serves as AI Bio Chief Executive Officer (CEO), and he is responsible for all aspects of the organization’s activities to support the forestry, agriculture and food sectors in Alberta. “I believe that my contribution to AI Bio is enriched by both my understanding and experience in Alberta, as well as by the international perspective I gained while directing the research efforts of a United Nations agricultural and forestry institute in sub-Saharan Africa,” Blade says. Assisting Blade on the management team are several Executive Directors. Executive Director Steve Price offers assistance to entrepreneurs and researchers and brings considerable experience working with industry to his position at AI Bio. After working as manager of forestry inventory and manager of silviculture with the Saskatchewan Government, Price held several positions with the Canadian Forest Service (CFS). This included Director of Operations for the CFS in Ottawa before returning to Edmonton. 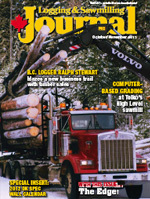 “My combination of operational forest management program development and implementation experience, coupled with my experience in managing research programs specific to forestry, positions me quite well to assist Alberta’s forest industry to move into the future and capitalize on innovation,” he says. Executive Director Carol Bettac looks after emerging opportunities and strategic alliances mainly at the intersection between forestry, life sciences and agriculture. She worked previously with the Institute for Agriculture, Forestry and the Environment and also has a business background. Currently, she is working with industry to identify what needs to be done within the existing bio-industrial infrastructure to take advantage of opportunities in the bio-economy over the next couple of decades. Dr. Cornelia Kreplin is aware of the importance of research in the overall quest to discover new pathways to sustainable production and maximizing return from the bio-economy in support of both forestry and agriculture. She was previously the director of Alberta’s Agriculture Research Division. Her role as an AI Bio Executive Director includes working with others to define future opportunities and to help people connect and collaborate so that they can capitalize on their respective strengths. “My role is to ensure that there are research projects out there that are focused on reducing the cost of production, adding value to the forest sector, while supporting sustainable production,” she says. Several other members of the AI Bio team are also engaged in supporting forestry-related research. Ted Szabo, Director of Forest Innovations at AI Bio, is focused on advancing the bio-economy in Alberta. He has extensive forest industry and academic experience, including research at Virginia Tech, the Canadian Forest Products Laboratory and Forintek Canada Corp, as well as at Alberta Forest Industry Development. He also has extensive forest industry experience working as a forester with several companies, as well as a plywood mill superintendent with Georgia-Pacific. Patrick Guidera, AI Bio Director of Forestry Technology, is working to build business-to-business relationships in the new Alberta bio-economy, specifically linking new technology providers to forestry companies with available biomass. He draws on considerable experience, including his previous position as director of Forest Business and Bio-economy Initiatives in Alberta Sustainable Resource Development. With a PhD in Forest Biology Management from the University of Alberta, Dr. Virginia Chavez reviews research proposals and provides follow up to research projects in the area of value chain sustainability. She has extensive experience in renewable resource management. Director of Agricultural Technologies at AI Bio, Dr. Christine Murray, graduated from the University of Guelph with a PhD, having written her thesis on woody plant physiology. She was most recently the Branch Head for Alberta’s Food and Bio-Industrial Crops Branch. At AI Bio, her work includes all aspects of the research funding process. The Canadian Wood Fibre Centre (CWFC) can help communities and the forest industry use short rotation woody fibre crops like willow and hybrid poplar to safely dispose of treated municipal wastewater and municipal and pulp mill biosolids. This method also helps produce a valuable cash crop that can be harvested for use in energy production or bio-chemicals, and as such contributes to rural sustainability in forestry and agricultural communities. The practice of using short rotation woody crops for bioremediation is already well established in Europe and CWFC has been working since 2006 to create a model suitable for use in North America. Through coordination with Alberta Innovates Bio Solutions, Alberta Environment, Alberta Municipal Affairs, forestry companies, and municipalities, it has established five demonstration sites that successfully show how treated municipal wastewater and biosolids can be safely used to irrigate and fertilize short rotation woody crops. The same opportunity is available to other communities across Canada faced with having to improve their municipal waste treatment systems. In addition to costing substantially less than an investment in a conventional engineered waste treatment system, communities also benefit by creating a valuable cash crop and local jobs related to the management and harvesting of plantations. Municipalities have the option of using the woody fibre themselves as a potential energy resource or selling it to forestry companies. “One of the benefits of the woody fibre crop could be as a potential biomass stream for use in biomass boilers and heating systems,” says Martin Blank, CWFC Wood Fibre and Bioremediation Technician. That is exactly what Camrose County is doing with a demonstration site it has established in the community of Ohatan, Alberta. The short rotation woody fibre grown as a result of the community using its municipal wastewater to irrigate a willow plantation will be used as a fuel source to provide 80 per cent of the county’s municipal building heating needs. CWFC also has demonstration sites in Beaverlodge, Whitecourt, Clairmont and the City of Edmonton. Blank says that there is strong evidence showing that developing a system to dispose of municipal wastewater by using it to irrigate and fertilize a short rotation woody crop costs only 30 to 40 per cent compared to the cost of an engineered waste treatment system. This represents a significant financial saving to rural forestry and agricultural communities that may have a limited tax base to draw upon to invest in new wastewater treatment systems to deal with either population growth or loss of population. To help communities decide on their best option, CWFC is developing an online decision support tool that can be used to compare the capital costs of the short rotation woody fibre disposal method versus an engineered waste treatment system. The tool will also factor in the financial benefit derived from using or selling the wood fibre. Communities will also be able to fine-tune their calculation depending on if their purpose is simply to treat wastewater or treat wastewater as well as generate a sustainable short rotation woody fibre crop. This second option requires more land so that communities have a crop to harvest each year. The decision support tool is expected to be available by April 2012. CWFC research has shown that municipalities could dispose of five million litres of treated wastewater per hectare per year, irrigating short rotation willow plantations of about 15,000 stems per hectare. To a great extent, this will determine the size of community where this system would be viable because it is highly dependent upon available plantation land. The plantation will generate a cash crop every three years and it must be harvested. Forest companies can also benefit by tying their fibre needs into this disposal method. Richard Krygier, Canadian Forest Service intensive fibre management specialist, says forest companies using municipal wastewater to fertilize hybrid poplar and aspen in large stem, high yielding afforestation plantations—where the end product is a log rather than biomass—can shorten the crop’s growing cycle. 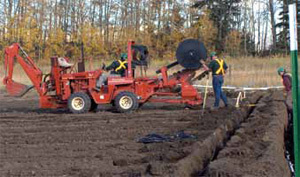 On one demonstration site near the town of Clairmont, Alberta involving the use of municipal wastewater generated by the town and Grande Prairie County to irrigate a hybrid poplar plantation, the growth cycle of the plantation is expected to be reduced from about 25 years to 18 years. CWFC has partnered with Ainsworth Engineered Forest Products, the County of Grande Prairie, Aquaterra Utilities Ltd. and Grande Prairie Regional College on this project. In addition to generating new fibre sources for existing production of forest products, Krygier says using this method may also help forest companies produce woody fibre as feedstock for new ventures. “A lot of this wood can potentially be channeled toward new bio-product systems that are being installed by forestry companies,” he says. In addition to wastewater, municipal and pulp mill sludge that typically builds up at the bottom of storage lagoons can also be used as an organic fertilizer on short rotation woody fibre plantations. CWFC is working to develop a network among existing demonstration site communities and industry representatives that the public can access as a resource to help answer questions about using this method of wastewater and sludge disposal as well as production of short rotation woody fibre crops. It appears that a breakthrough in construction of wood buildings that are nine or 10 storeys high—more than double what was permitted less than five years ago—could be just around the corner, and FPInnovations is providing the technical know-how to help make this a reality. For the past six years, FPInnovations has been working to provide new solutions for wooden mid-rise buildings and their acceptance in North American codes and standards, with encouragement and financial support from Natural Resources Canada (NRCan). British Columbia Premier Christy Clark recently called on architects, designers, and engineers for ideas on how to create the world’s tallest multi-use wood building in Prince George. The 10-storey iconic structure, to be located at the site of the Prince George Hotel, will house the Wood Innovation and Design Centre (WIDC). In addition to the building representing an engineering marvel demonstrating a potential use for new wood products like cross-laminated timber (CLT), the B.C. government hopes that the WIDC will help to revitalize the forest industry and support generations of jobs for local and rural economies. Construction of the centre should begin by 2012 with completion in 2014. FPInnovations has gathered strong scientific evidence that building with wood offers a number of dividends, including carbon storage, better environmental footprint and less greenhouse gas emissions from manufacturing, compared with non-wood materials. Wood can also be cost-competitive with building types where masonry, concrete and steel are used. More and more engineers, architects and owners are showing an interest in designing and building with wood, which may translate into an increased demand for wood in mid-rise and even high-rise buildings. For this shift to occur, though, designers and building officials need to better understand the overall performance and behavior of wooden structures so that they can perform competitively with more traditional materials like concrete and steel. FPInnovations is leading the way, with funding through NRCan’s Forest Research Institutes Initiative and by providing better understanding and knowledge related to the performance of structural components and systems under various loads and environmental conditions. To help architects and builders consider more wood use in mid-rise and tall building construction, FPInnovations has released a primer and a comprehensive handbook that contain key technical information related to the manufacturing, design, and performance of CLT as a product and a structural system. CLT is a new, cost-competitive building system that complements existing light-frame and heavy-timber options. FPInnovations conducted intensive multidisciplinary research on CLT and found that CLT buildings have good fire resistance and can be configured to minimize the transmission of sound, thus providing the same advantages as that of concrete buildings. It has also been demonstrated—by testing and analysis— that light wood frame and CLT systems can resist major earthquakes. Since CLT is prefabricated, the system is precise and results in faster project completion, increased safety, less demand for skilled workers on site, less disruption to the community and less construction waste. CLT has been used extensively in Europe as early as 1995. To gain wide acceptance in North America, CLT as a product and structural system needs to receive recognition in North American codes, alongside traditional structural products and systems. At present, CLT is being used under the ‘Alternative Solutions’ clause in building codes, which requires the building designer to demonstrate that a building using CLT structure would perform equal to or better than one built with a system that is already accepted in the code. The designer needs credible peer-reviewed information to use CLT, and that is one reason why the FPInnovations CLT Handbook is so valuable. 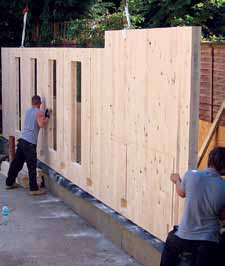 FPInnovations has identified ‘three best bets’ as offering the best wood-based solutions in the building environment. These are: a light frame system, which is used mostly in North America; a heavy timber post and beam system, which was used a century ago in Canada to build structures of up to eight stories high; and, CLT. There is also hybrid construction, which can be a mixture of any of the ‘three best bets’, or a combination of wood with other materials like steel and concrete. The light frame system is recognized as an acceptable solution in codes and standards for buildings of up to four storeys high in Canada, with the exception of British Columbia, which in 2009 changed its building code to allow for this system to be used for structures of up to six storeys high. FPInnovations’ research was instrumental in the development of the Association of Professional Engineers and Geoscientists of British Columbia’s guidelines for mid-rise wood-frame buildings, which provides designers with an example of how to design a six-storey wood-frame structure. Although the post and beam system was used to build structures as high as eight storeys a century ago in Canada, current building codes allow for this system to be used for the construction of buildings of only up to four storeys high. FPInnovations has been working with the design and construction communities to change this restriction. A six-storey building in Quebec, the CSN Fondaction, was constructed under the alternative solutions path in the Quebec Building Code. FPInnovations is planning to publish a design manual that will further assist the design and construction communities to revive this system.